In recent weeks with the slower pace at the farm during colder weather we’ve turned our attention to a series of special events featuring our Palouse Heritage grain flours. Having participated in every Cascadia Grains Conference that the Jefferson County Extension Service has held in Olympia for the past five years, we were honored again this past January to present at the “Taste the Grain” dinner held at historic Schmidt House. The mansion was built a century ago in Colonial Revival style for the founders of Olympia Brewing and was an ideal setting for us to sample the array of breads and brews provided by Rob Salvino at Seattle’s Damsel & Hopper Bakeshop, South Sound Community College Culinary Science chefs Kelly McLaughlin and Isaac Gillett, and Copperworks Distillery. Below is the dinner menu we formulated for the evening, and for the first time we included a series of pairings featuring craft brews and distilled products. Of course we can’t guarantee that you’d find these offered on the bill of fare at famed The Spar in downtown Olympia during the periods specified, but there are historical reasons for these combinations. Thanks again Rob, Lara, Aba, Kelly, Isaac, and Olympia historian Don Prosper for such a marvelous event! This post is the third and final of a three-part series focusing on delicious, wholesome bread recipes that feature our landrace grains. These recipes and many others are included in our newly released updated edition of the Harvest Home Cookbook, available here in both print and eBook versions. The restoration of landrace grains and availability today of identity-specific variety flours also makes possible the customization of time-honored recipes to flavor and texture preferences with consideration of new techniques. At Palouse Heritage we have worked for years to foster “flavorful authenticity” by providing an array of nutritious pre-hybridized landrace grain flours like Crimson Turkey hard red wheat, Sonoran Gold soft white, Yellow Breton soft red, and Purple Egyptian barley. These and other grains arrived from Eurasia during the earliest years of North American colonization to make possible a incredible continental cornucopia. Ancestral country-bread styles handed down through the ages were not necessarily meant to be unchangeable, fixed lists of ingredients and directions. Now in her hundredth year, spirited Vera Grove Rudd is the eldest member of our extended clan. She was raised at our Palouse Colony Farm and vividly recalls joining her mother to gather hops that grew profusely along the river in order to make a sourdough starter from the naturally occurring yeast that grew on the cones. I have recently learned that this practice was a folk remnant of common practice in medieval times. The hops still grow at the farm in abundance, but times change and Vera came to use store-bought active dry yeast for her country-style breads. As times change so can baking methods and availability of healthy ingredients. Rather like Van Gogh at work on his glowing harvest canvases or Thomas Hart Benton painting Midwest threshing scenes, distinct grain flours serve like paints to enable artisan bakers at home or elsewhere to follow long favored ways, as well as make marvelously new variations. Although country-style breads have generally been made without eggs, dried fruit, or baked vegetables, these ingredients have long been included by experienced home cooks for special holiday breads. The following recipe from our extended family’s hundred-year-old matriarch, “Miss Vera,” brings to mind her stories of enjoying it every Friday evening when she was a girl living on the family’s Palouse River farm. Recipes like this were popular submission to the many school PTA, church, and social organizations loosely bound cookbook fundraisers. She noted that her mother gathered hop cones every summer for yeast that imparted a unique and wonderful flavor. Dissolve yeast in mixing bowl with ½ cup of water. Stir in milk, sugar, and salt. Add eggs, shortening, and half the blended flour. Stir with a spoon, add the rest of the flour, and mix by hand. Turn onto lightly floured board. Knead about 5 minutes until smooth and roll around in a greased bowl. Cover with damp cloth and let rise in a warm place 1 ½ to 2 hours until double in bulk. Punch down, round up, let rise again about 30 minutes until almost a double in volume. Divide dough into 6 parts, making six 14-inch long rolls. Braid 3 rolls loosely, fastening ends. Repeat for second braid. Place on 2 greased baking sheets, and cover with a damp cloth. Let rise 50-60 minutes until almost double in bulk. Heat oven to 425°. Brush braids with glaze of egg yolk and 2 tablespoons of water. May sprinkle with crushed walnuts. Bake 30-35 minutes. Since time immemorial bakers worldwide have paired country-style breads with delicious soups, stews, and broths for the ultimate comfort foods. The recent renaissance in breadmaking at home and neighborhood bakeries have revived interest in traditional styles with names that reflect their global origins—English Farmer’s Bread, German Landbrot, French Pain de Campagne, Italian Pan Bigio, and Spanish Pan Campesino Rústico. Even within these styles is a wondrous culinary variation in shape, ingredient combinations, and baking techniques. 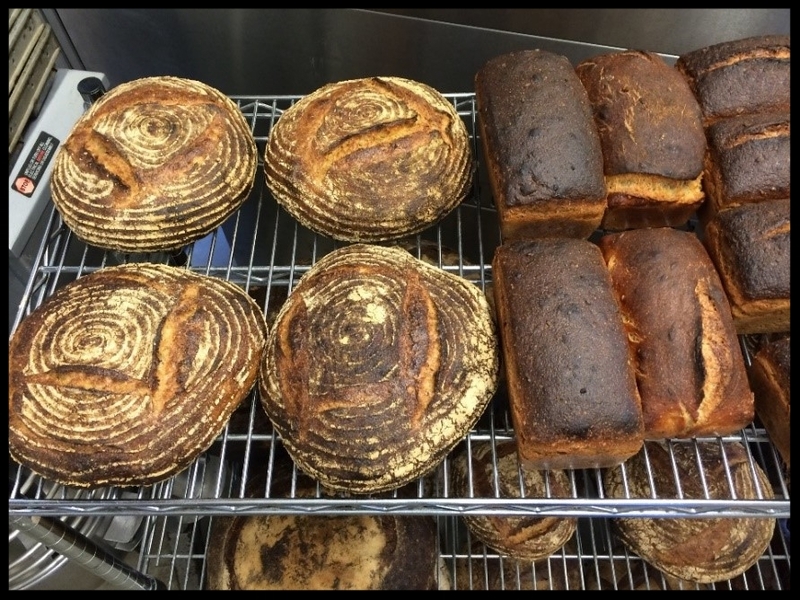 Country-style breads stand apart from mass market brands that use highly refined, single identity flours and chemical additives. Instead, these favored working-class breads that have long graced tables of homes, inns, and popular restaurants are generally characterized by the use of whole wheat flour (70-85%) in combination with a smaller amount (15-30%) of flour from another grain. Such blends, especially when working with whole grain flours and natural yeast leavening, yield denser, more nutritious loaves of lesser volume. In many European cultures the most commonly used secondary flour is rye which adds a satisfying tangy flavor. Other traditions prefer the mildness of oats (Scottish Harvest Struan), nutty barley (Ethiopian Habesha Dabo), and cornmeal (Boston Brown Bread). Country bread recipes also often include potato water or milk to hydrate the flour rather than plain water. The recipe below is for a wonderful bread that has long sustained members of our family and friends who have regularly asked for the correct flour proportions. Weissmische is German for “blended white” flour and homemakers have long safeguarded the distinct ingredient combinations considered to be most appealing. Our elders traditionally served it as rundbrot, or in the shape of a “round bread” sun-wheel. Wheat-rye flour blends remain popular throughout Germany today where various regions take pride in distinctive ingredients and baking methods. This bread also makes our favorite toast which we often enjoy liberally spread with Mom’s homemade strawberry jam. Dissolve 2 ¼ tablespoons yeast in 6 ounces of warm water. Add 1 teaspoon of white sugar, mix, and let rise to top of cup. Mix yeast mixture with 3 cups of milk. Add rye and wheat flour and knead or use mixer for 10 minutes. Place dough in greased bowl and let rise until double, or about 1 hour. Remove from bowl, punch dough, and knead down. Shape into 3 loaves and bake in 3 greased loaf pans for 35 minutes at 375°. This past week marked the beginning of our Palouse Heritage harvest as our first crop of organic Turkey Red bread wheat was cut at our partner Brad Bailie’s Lenwood Farms near Connell, Washington. We have been raising this legendary hard red bread grain for the past two years in order to carefully increase our seed stock, and finally this year we had enough for several acres of organic production at Brad’s farm since we needed space at our Palouse Colony Farm for the flavorful soft red variety English Squarehead, also known as Red Walla Walla, which historically was used for pastries, biscuits, and other flatbreads as well as for crafting nutritious Old World Hefeweizen cloudy brews. Turkey Red is the legendary grain long raised by our German ancestors in Eastern Europe where bread wheats had grown since time immemorial from the Great Hungarian Plain to the steppes of Russia and Ukraine. Prior to the introduction of Turkey Red to the Midwest in the 1870s, a winter variety sown in the fall, and its genetic spring-seeded cousin, Red Fife, an Eastern European relative that came to North American via Scotland, all wheat breads in early America and Canada were made from soft white flour sometimes mixture with low gluten milled rye, barley, or oats, or “thirded” combinations of these grains. 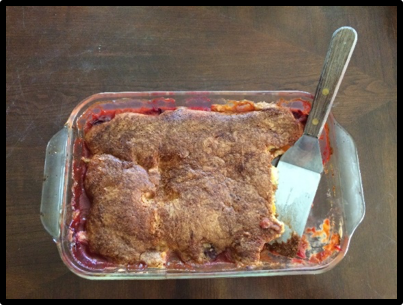 The resulting baked goods were rather dense but still flavorful and served as the “staff of life” for countless families in eastern American and on the western frontier. Our elders here in the Northwest told us that their crops of Turkey Red as recent as the 1950s were too precious to sell like modern hybridized grains for national and world markets. 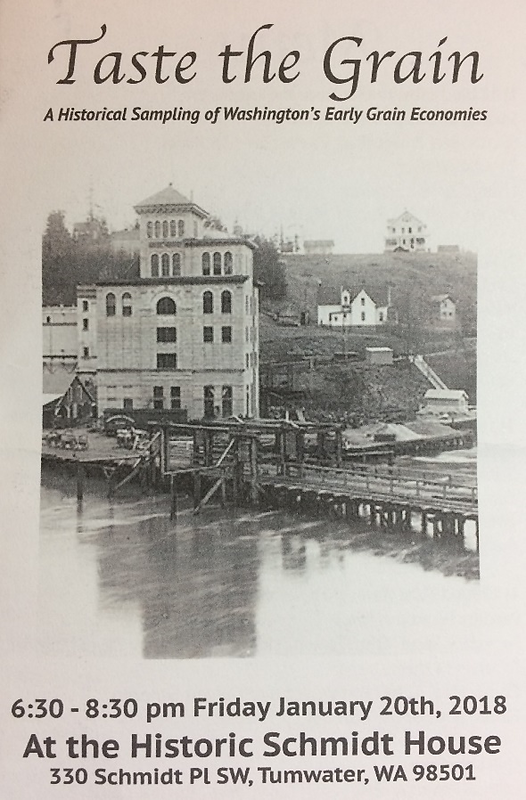 Instead they held back sufficient quantities of Turkey Red to be milled at area flour mills in Colfax, St. John, and at tiny Pataha south of the Snake River near Pomeroy where historic Houser Mill has been substantially restored by the Van Vogt family with a portion of the main floor refurbished as a restaurant and museum. "Our elders here in the Northwest told us that their crops of Turkey Red as recent as the 1950s were too precious to sell like modern hybridized grains for national and world markets." Unexpected happenings often occur when commencing harvest and this year’s first round provided a couple interesting moments. After going a few dozen yards on our first round in Brad’s combine, I stepped behind the machine to blow on the ground and see if too much grain was being blown behind. Even the most advanced combine in this day of high tech threshing and electronic monitoring betrays some grain loss, but Brad’s John Deere was running very clean. I jumped back on and paused when entering the cab so we could check for any cracked grain going into the bulk tank where the grain is stored before unloading into a truck or in our case, large fabric totes capable of holding a ton. We had no sooner reached our arms back to retrieve a handful of grain that a wild onslaught of very angry yellow-jackets burst forth swirling around our heads! In an instant we received their stinging message of most likely disturbing a nest in the process of putting running augers and dumping grain into the bin, so we retreated back into the safety of the cab. On the next pass around the field I noticed an enormous bird fly from the uncut grain we were approaching as the combine reel flailed along like a rapidly moving ferris-wheel. Brad immediately stopped the machine and said he it was one of several marsh hawks with whom he had shared his property. Brad is an advocate of natural growing systems and seeks to preserve native species, so was concerned that the hawk’s next was likely in the path of the combine’s next round. We descended the ladder and slowly approached the area in the uncut wheat from which the bird had taken flight. Sure enough there we found a trampled area about two feet in diameter with two white eggs resting in the center. Late July seems somewhat late for a hatch, but not being experts on marsh hawk habits we thought the eggs were likely still vital or they would not still be tended. So we returned to the machine and cut in a wide circle all around the next to keep it protected, and hoped no coyotes would find their way to the small golden sanctuary. Later in the day I took a sample of the Turkey Red to the Connell Grain Growers substantial grain handling facility in Kennewick in order to get it tested for protein and moisture. The place is a massive complex located along the Columbia River and a several tractor-trailers filled with wheat were waiting in line to dump their loads in the elevator grates for storage in the adjacent concrete and metal silos. I was ably assisted by Kara Shibley, Angie Garcia, and Jose Carrea-Moya who shared my interest in heritage grains though our conversation was regularly interrupted by intercom calls and other office traffic attesting the incredible pace of harvest work inside such offices as well as out in the fields. The result came back in moments most satisfactorily, so we did it again with another sample and the numbers were identical—low 9.1% moisture, and very strong 13.5% protein—fully two percent higher than the average of modern hard red wheats then coming to the elevator. With that good news it was back to work and preparations to harvest our stands of soft red English Squarehead (aka Red Russian), Purple Egyptian hulless barley, and other grains scarcely seen in the region for over a century. The flavorful and nutritious adventure continues!